Prior to the season City announced they would be starting a revolutionary experiment to help stop the the queues that had occurred when fans camped out for days to ensure they received a Cup Final ticket. The club would issue tokens for all first and second team matches and these could be exchanged for tickets at all ticket games. three days before the season started the team were boosted when Don Revie withdrew a transfer request from the previous season, Revie said “…I realise now that I was hasty in applying for the transfer in the first place”. The Blues played one pre-season friendly, drawing 2-2 against a Great Britain XI . It was not to prove a good start to the season for the Blues as they drew 2-2 at home to Aston Villa then crashed 7-2 at Wolves and drew 2-2 at home again, this time to Arsenal , and so when the first league tables were issued they were third from bottom on two points. City got their first win at a sun drenched Maine Road as they beat United 1-0 in the Manchester derby thanks to a great display by custodian Bert Trautmann. and the German was the hero again as the Blues drew 0-0 at Arsenal and then beat Cardiff 3-1 at Moss Side. The Blues then drew 3-3 at Huddersfield and then in front of a crowd in excess of 63,000 at Maine Road City beat the only unbeaten league side, Blackpool , 2-0 and so after a slow start City had only lost once in their first eight games. 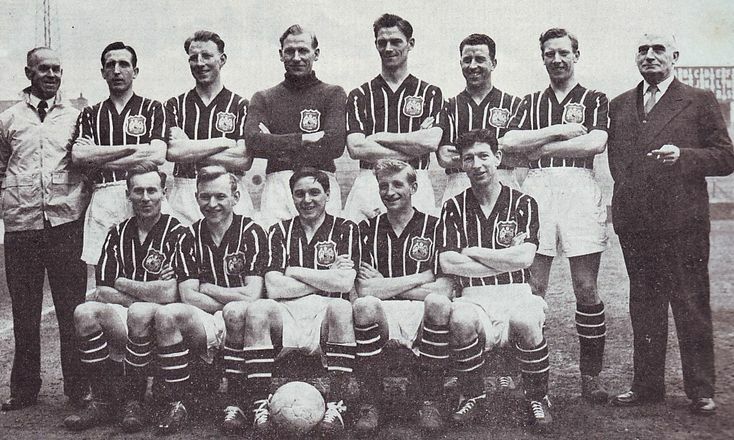 Without the services of Don Revie, who was on international duty with England in Denmark, City went down 2-1 at Chelsea and then managed a 1-1 draw at Sheffield United . A break from league football and City played a friendly under the floodlights against Glasgow Rangers and lost 2-1. City lost two further games in the league, 2-0 at home to Preston and 4-3 at Birmingham , before a much needed win as they beat West Brom 2-0 at Maine Road. A further friendly against Scottish opposition saw City lose 2-1 at Hibernian . Bonfire Night saw a ‘damp squib’ of a performance by The Blues at the Valley as they lost 5-2 against Charlton . and then the Blues failed to win in their next four games, losing 2-1 at home to Tottenham , drawing 1-1 at Everton , losing again at home, to Newcastle 2-1 and drawing 2-2 against Burnley at Turf Moor. At Maine Road City got back on track beating Luton 3-2 and then they won again, 3-0 at Aston Villa. A busy festive period then saw the Blues play four games in eight days. On Christmas Eve they drew 2-2 at home to Wolves and then on Boxing Day a 3-1 win at Bolton saw City move up the table slightly, after 23 games they were 14th on 24 points. Bolton were sick of the sight of City as they beat Wanderers again the next day, 2-0 at Maine Road on a sodden pitch which the Manchester Guardian described as resembling in texture the paddy fields of Burma. In the last game of 1955 City travelled to Old Trafford and were edged out 2-1 by Manchester United . 1956 started well for City as they beat Portsmouth 4-1 at home. And then in the FA Cup 3rd Round at a fog enshrouded Moss Side, City were drawing 1-1 with Blackpool and after 56 minutes of what could only be described as a farce of a game, it was abandoned as 35,000 fans were failing to see a hand in front of their faces never mind a football. The re-arranged game almost didn’t go ahead, this time due to a quagmire of a Maine Road pitch, however the full 90 minutes were played and City triumphed over Blackpool 2-1. Back in the league City lost 4-1 at Cardiff and then beat Huddersfield 1-0 at Maine Road before facing a potential banana skin in the 4th Round of the FA cup as they faced Third Division Southend at a still partly built Roots Hall, and in a close game City booked a place in the 5th Round with a 1-0 win. The Blues’ league form continued to improve as they beat Blackpool 1-0 at Bloomfield Road and then drew 2-2 with Chelsea at Maine Road. 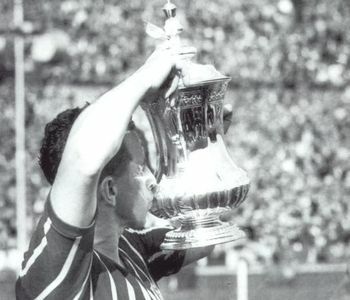 City’s attempt to get to the FA Cup Final for the second season on the trot continued as they drew 0-0 at Maine Road in the 5th round against Liverpool , and then at Liverpool in the replay the Blues’ scraped through 2-1. Another win in the league, 3-0 at Preston gave City further confidence in the FA Cup as they met Everton in the 6th Round and a Maine Road crowd of over 76,000 paying over £10,000 saw a classic tussle as The Blues’ booked a semi-final place with a 2-1 win. 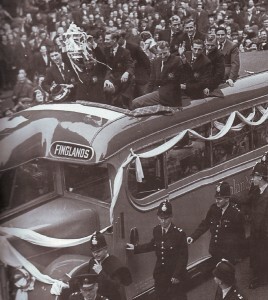 Everton played City again four days later in the league at Maine Road and City won again, 3-0, and then beat West Brom in Moss Side 4-0, it was the Blues’ fifth win on the trot and moved them up to 3rd in Division 1, eleven points behind leaders Manchester United but with three games in hand. The semi-final of the FA Cup was held at Villa Park and City made it six wins on the trot as they beat Tottenham 1-0 to return to Wembley after losing there in the final 12 months earlier. 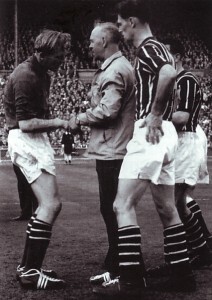 Perhaps the strain of the cup run was starting to tell as City then lost two games in the league, 2-0 at home to Charlton and then 2-1 at Tottenham , however they did beat Sunderland 3-0 at Roker Park, before drawing 1-1 at home to Birmingham in a rehearsal for the FA Cup final which was just over a month away. A good 4-2 home win over Sunderland kept City in third place in the league with five games left to play. Bert Trautmann’s five star performances were then acclaimed by the Football Writer’s Association as they announced he had won the Footballer of the Year trophy. The Blues then lost 3-1 at Newcastle , beat Sheffield United 3-1 and lost to Burnley 3-1, both games at Maine Road, and in the penultimate game of the season they lost 3-2 at Luton which saw them drop to fifth in Division 1, whilst neighbours United were named champions. The last game of the season saw City beat Portsmouth 4-2 at Fratton Park and ended the season fourth in Division 1 on 46 points. 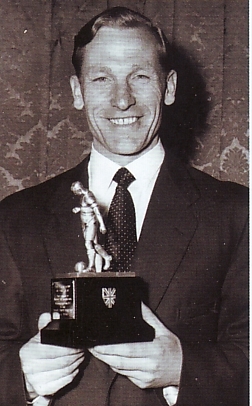 Two days before the FA Cup Final Bert Trautmann was presented with his Footballer of the Year award in London. he went on to make further saves at the oppositions feet and as clearly in agony, however he made it to the final whistle and managed to climb the famous 39 steps to receive his medal from the queen. 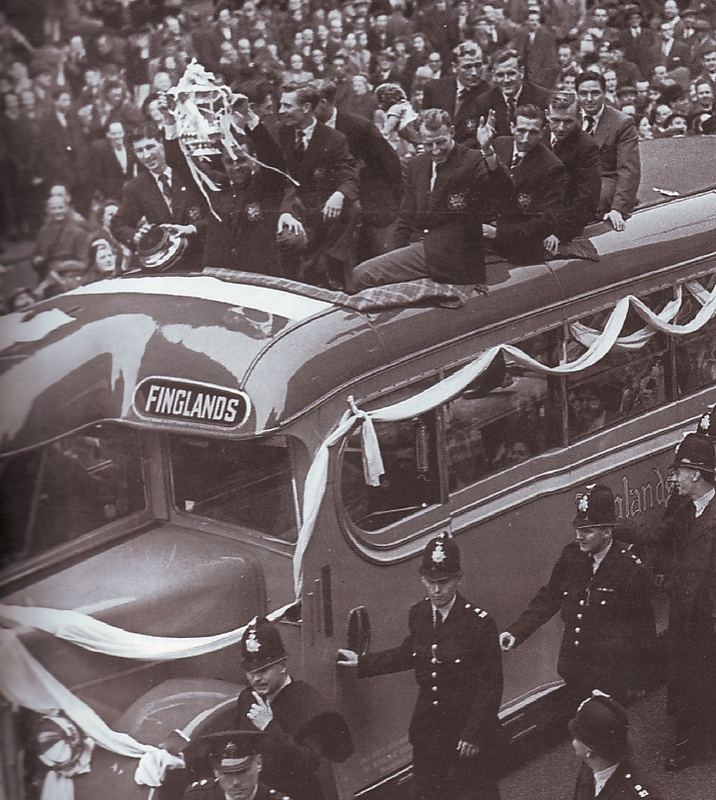 The team returned to Manchester to a tumultuous civic reception at the town hall where Roy Paul lifted the FA Cup aloft for all of Manchester to see. City went on an end of season tour of Germany where they beat Preußen Münster 3-1, drew 1-1 with Eintracht Nordhorn and beat Werder Bremen 4-1. They then drew 0-0 against Munich 1860 , before finishing with two victories, 3-1 against PSV Pforzheim and 6-1 against Sterk Dusseldorf.